Mar 31, 2006 The Casey Files: Shadow Statistics Doug Casey 321gold . . .
British politico extraordinaire Benjamin Disraeli has been much quoted for his saying "There are lies, damned lies, and statistics!" And you know the old quip that nothing is scarier than hearing someone say, "I'm from the government and I'm here to help you." Combining the two very well might result in the poor joke the government-reported statistics have morphed into over the decades. While initially, one might suppose, measures of things like inflation and employment might have been well-intentioned-if for no other reason than that they purport to give people and businesses some basis on which to forecast their own activities-government has increasingly diluted, skewed, tampered with and downright fabricated the data in order to paint the rosiest possible picture. In the following article Doug Hornig, one of the editors here at Casey Research, pulls away the curtain on this shameful shell game and in the process provides you with a rare glimpse of things as they actually are, versus as the government wishes you to think they are. Fortunately, armed with insights that most Americans will not be privy to until it is too late, you are able to protect yourself with investments in sectors that will provide extreme profits as the house of cards begins to collapse. Of course I refer to gold and silver bullion and, for the biggest returns, the carefully selected stocks of junior companies involved in precious metals exploration. Read on, and don't hesitate to pass this along to anyone you care about. You're bombarded with all those statistics that pour out of Washington, the ones that appear to show how unemployment and inflation are low, GDP is expanding, and so on. They may not square with your personal experience, but after all, the government pays a lot of people with fancy degrees a lot of money to carefully track economic statistics. So you figure the numbers must be somewhat accurate. But now a man has come out of the woodwork who's done the real math and properly crunched all the numbers. His conclusion: "If the numbers don't seem real to the man in the street-they probably aren't." Our new friend is Walter J. (John) Williams, with a B.A. in Economics and an M.B.A., both from Dartmouth. He serves as an economic consultant, both to private individuals and Fortune 500 companies. "For more than 20 years," he writes on his website (www.shadowstats.com), "I have been a private consulting economist and, out of necessity, had to become a specialist in government economic reporting." Has he ever. What Williams does (and few others bother to do) is read the fine print. The government, he notes in a recent interview with Kathryn Welling of the welling@weeden investment newsletter, "is very honest in terms of disclosing what it does. It always footnotes the changes and provides all the fine details." It is in those details-no surprise-that the devil lies. "What has happened over time," Williams says, "is that the methodologies employed to create the widely followed series, such as . . . the GDP, the CPI, the employment numbers, all have had biases built into them that result in overstating economic growth and understating inflation." "Real unemployment right now-figured the way that the average person thinks of unemployment, meaning figured the way it was estimated back during the Great Depression-is running about 12%. Real CPI right now is running at about 8%. And the real GDP is probably in contraction. I venture that if you talked about those numbers now with the average person, they would say that they seem reasonable . . . my work shows that the economic perceptions of non-professionals actually have some real validity; there are in fact reasons for the disconnect between official statistics and what the populace is feeling." According to Williams, government realized as long ago as the Kennedy administration that Americans would rather hear good news even if it's false, and so the manipulation of data began. Unemployment was easy. First they created the "discouraged worker" category (those who've given up on finding a job) and counted them separately. Then, under Clinton, they quit counting them at all. Upwards of five million out-of-work people were suddenly no longer "unemployed." Consumer Price Index? Since Jimmy Carter, every administration has messed with it. In order to make it look decent, Alan Greenspan and Michael Boskin, former head of the Council of Economic Advisors, came up with the "substitution" concept. Williams: "The whole purpose of the CPI [was] to measure the change in the cost of a fixed basket of goods over time . . . What Boskin and Greenspan argued was, 'We should allow for substitution because people can buy hamburger instead of steak when steak goes up.' The problem is that if you allow substitutions, you aren't measuring a constant standard of living. You're measuring the cost of survival." Who gets squeezed by this? Fixed-income people. "The difference that it makes is significant: if the same CPI were used today as [under Carter], Social Security checks would be 70% higher." An adjunct to substitution is "weighting," adopted under Clinton, whereby the Bureau of Labor Statistics changed from a straightforward arithmetic to a reality-challenged geometric method, a move Williams calls "a pure mathematical game." The gist of the change is this: now, if something goes up in price, it gets a lower weighting in the CPI, and vice versa. Voilà. Down comes inflation. There's also hedonics, which we covered in an earlier WWNK article. Simply summarized, this means that if a product is "improved," then it is deemed to have come down in price, even if you're paying more for it. Gross Domestic Product? "If you adjust the real GDP numbers that the government releases for the myriad revisions and redefinitions that have been applied to the measure with increasing frequency since the mid-1980s, you find that there's a happy overstatement of growth of about 3% on a year-over-year basis . . . it's important to realize that if inflation is understated, then reported 'real' growth will be overstated." Yet "manipulations of the CPI . . . pale next to the impact of imputations in the GDP." Talk about insidious. To the government, "[any] benefit a person receives has an imputed income component." Thus, for example, if you're a homeowner, forget that backbreaking monthly mortgage payment, you're considered to be paying yourself rental income on your home! No kidding. It's called "imputed interest income," and it's the fastest-growing segment of citizens' personal income. Not only does this phantom cash jack up GDP, it also inflates average household income, which is actually dropping. This we can all see in the explosion of personal debt because, as Williams says, "without growth in income you just can't support growth in personal consumption on a healthy basis, so you do it on an unhealthy basis. You borrow money." And while the amount the government admits it is borrowing may look horrifying enough, the reality is far, far worse. What follows is not for the faint of heart. Williams says that the feds take a stab at reporting their accounts according to "generally accepted accounting principles," or GAAP. Although the numbers include "all sorts of disclaimers," and exclude Social Security, Medicare, Medicaid and similar accounts, "They at least do put out a financial statement. It's the best they can come up with." However, "The budget deficit numbers you hear announced at White House press conferences are from accounts kept on a cash basis, with no accruals made for monies owed by or due to the government in the future." What's the difference? A lot. In 2004, the deficit was reported at $412 billion. The official GAAP-based number published by the Treasury Dept. was $616 billion. Add in the net present value of the underfunding of Social Security and Medicare, and what you get is $3.4 trillion. Yes, trillion. And that's if you ignore a one-time spike from the setting up of the new, utterly unfunded Medicare drug benefit. The true GAAP-based deficit has been holding steady in that range. $3.7 trillion in 2003, $3.4 in 2004, $3.5 in 2005. "[T]otal federal obligations at the end of September were $51 trillion," says Williams, "over four times the level of GDP. It is unprecedented for a major country to have its actual obligations so far out of whack." Williams's conclusions about what comes next are grim. "The Fed will back the system with every dollar it can print. But of course that would go on top of what is already an uncontrolled federal deficit. The end result, when it does all come together, will be something akin to a hyperinflation, but at the same time you'll have also a very depressed economy. So there'll be an inflationary recession, which I think we're already beginning to get into." Despite his dire research findings, "I am an optimist at heart," Williams admits, and he echoes Doug Casey's own words when he says, "If you're able to somehow protect your assets and liquidity through the very rough times ahead, you're going to have some of the greatest investment opportunities that anyone has ever seen." 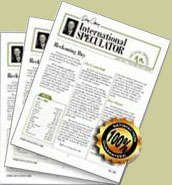 Doug Hornig is an editor for Casey Research, publisher's of the International Speculator, the nation's foremost publication dedicated to identifying undervalued opportunities in precious metals stocks and other speculations with the potential to generate a 100% or better return over the next 12 months.